The National Anomaly Committee will meet leaders of central government employees unions including National Joint Council of Action (NJCA), who have demanded hiking minimum pay Rs 18,000 to Rs 26,000 against the recommendations of the 7th Pay Commission. 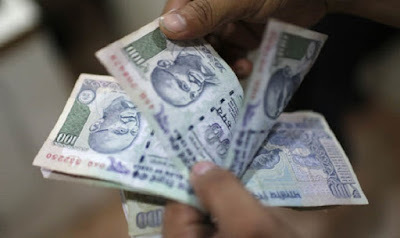 New Delhi, Aug 30: The National Anomaly Committee will meet leaders of central government employees unions including National Joint Council of Action (NJCA), who have demanded hiking minimum pay Rs 18,000 to Rs 26,000 against the recommendations of the 7th Pay Commission. The National Anomaly Committee was formed to settle issues arising out of the implementation of the 7th Pay Commission recommendations. After reports that government would not be increasing the minimum salary which has been fixed as Rs 18,000, aggrieved central government employees pin their hope in the outcome of the meeting. “The National Anomaly Committee has invited us for talks on September 1 in Delhi ahead of proposed nationwide general strike on 2 September and we have agreed to participate in the talks,” NJCA convener Shiv Gopal Mishra was quoted as saying by the Sen Times. The NJAC has demanded for hiking minimum pay Rs 18,000 to Rs 26,000. 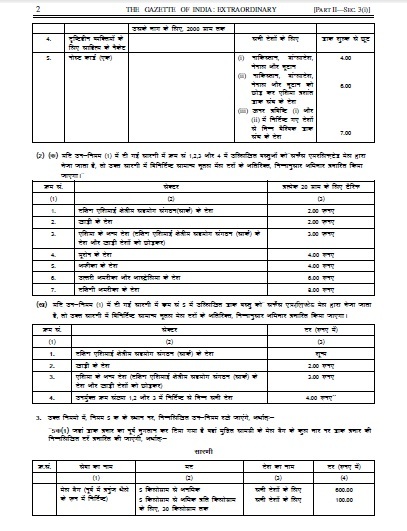 Along with increase in minimum pay, the NJAC also wants government use 3.68 fitment factor, instead of 2.57 in calculating the minimum salary. If the National Anomaly Committee accepts demands of NJAC, the salary and pension of central government employees will go up. 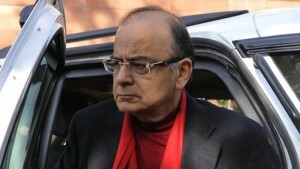 Though Union Finance Minister Arun Jaitley promised to consider to hike the minimum pay, a day after the cabinet cleared 7th Pay Commission recommendations, central government employees were unhappy after reports surfaced claiming that they are not going to get more than minimum pay of Rs 18,000 as the public sector workers have also demanded minimum pay of Rs 18,000 which will bring extra burden on government. 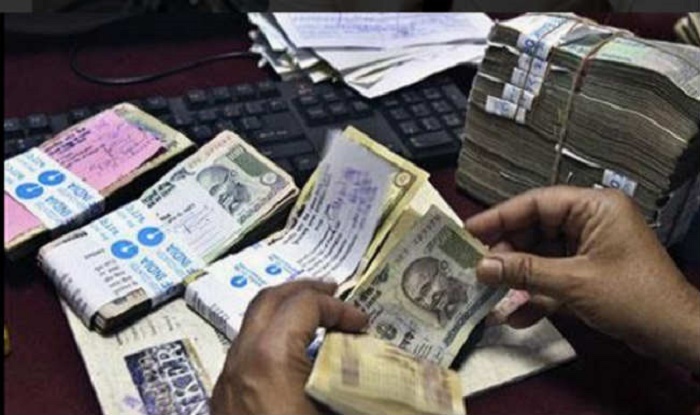 Sources in Finance Ministry also said that there is no scope to change in minimum pay Rs 18,000. 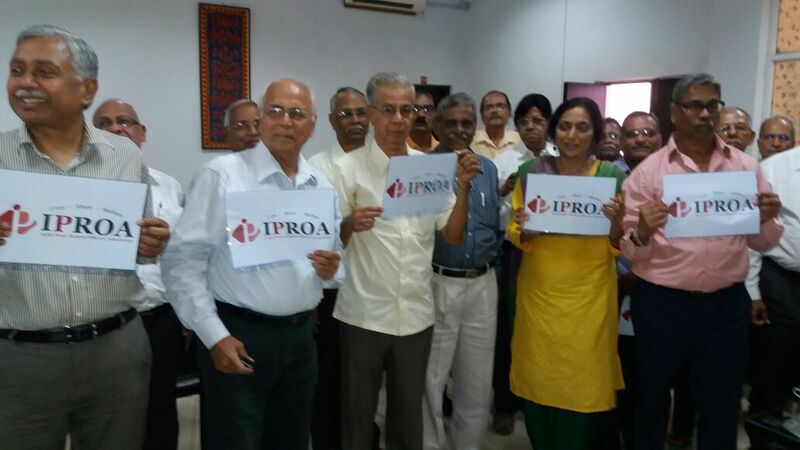 Representation on implementation of option -1 of 7th CPC relating to pre 2016 pensioners. Patel Bhawan, New Delhi – 110001. ( Kind Attention: Shri Chirravuri Vishwanath IAS ). 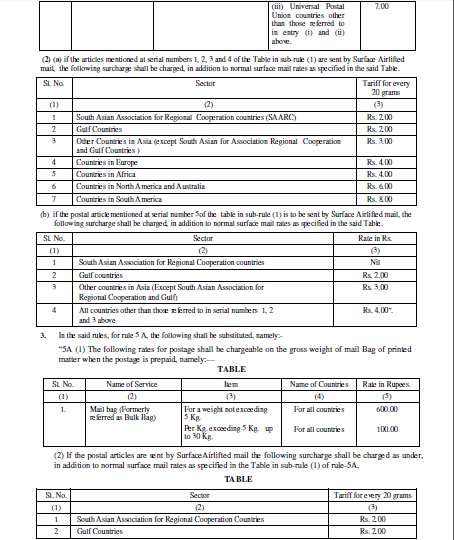 Subject: Feasibility of implementation of recommendations accepted by GOI contained in paras 10.1.67 & 10.1.68 of 7CPC report. Accepted to the extent that pension of pre 1.1.96 retirees including pre-86 retirees shall be consolidated as on 1.1.1996 as recommended but the consolidated pension shall be brought on to the level of 50% of the minimum of the revised pay of the post held by the pensioner at the time of retirement. Nos. 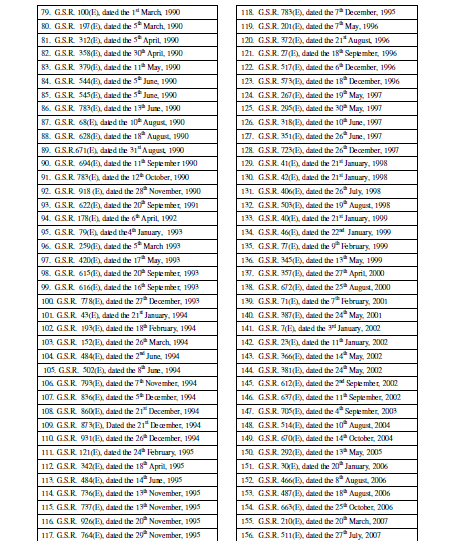 45/86/97-P&PW(A) Part-II dt. 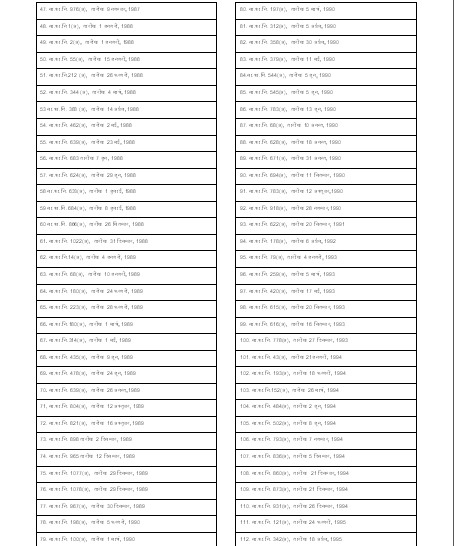 27.1099 & 45/1098-P&PW(A) dt 17.12.98 refer. iii). Pension record is of permanent nature and if it is to be destroyed, proper permission from the competent authority is to be obtained. In any case, these record can always be reconstructed taking the details from various sources available in the department and the material collected from the Pensioner. 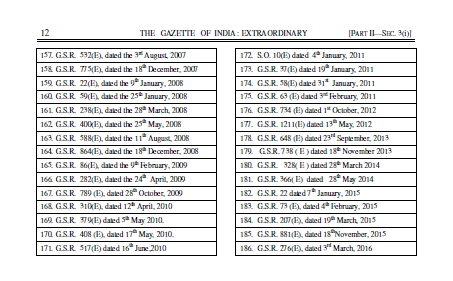 In this regard attention is also drawn to recent CAT Bombay Nagpur Bench judgement dated 09.03.2015 in case of Smt. Saija vs. General Manager, Central Railway O.A.No. 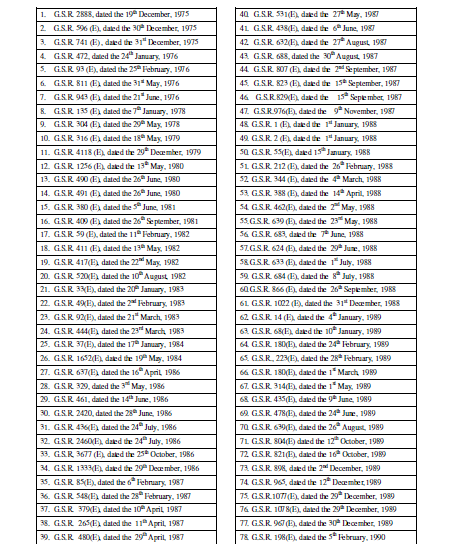 2131 of 2011(CAT Bombay Bench at Nagpur) It is also pointed out that never ever any department in any of the Court cases brought out the issue of non-availability of records. 2. It was possible to implement the above recommendations of pay panels and issue revise PPOs as records were traced out, probably due to some incentive given to the staff concerned for revising the PPOs of pre-1986 retirees involving notional fixation. Railway administration for certain gave incentive to the staff concerned for implementing 5th CPC recommendations. It is reliably learnt that as no incentive for additional work involved in revision of PPOs after 6thCPC was offered. Rly Admn did face some difficulties in implementing recommendations of 6th CPC and consequential issue of revised PPOs to pre-2006 retirees, still as per Rly Board 100% PPOs could be revised. Govt. records can speak of the position of incentive offered by various departments concerned. It is one of the suggestions to consider incentive to staff to ease the problem of locating old records/information required, since in 90% cases records are available and remaining can be recasted. 3. 7th CPC considered the long standing demand of pensioners retired in earlier CPCs regimes to grant them parity in fixation of pension with those retiring subsequently after implementation of its report. Accordingly, 7th CPC has recommended granting benefit of increments earned by the pensioner in the Pay Band and Grade Pay/Scale of Pay for 01.01.2006 Pensioners, while determining their notional pay as on 01-01-2016 at a level in the pay matrix given by the 7th CPC. Pension would be fixed at 50% of the notional pay so arrived. 4. Apprehension of non-feasibility of recommendation, discussed in para 3 , due to non-availability of records is further narrowed & not zeroed. PPOs issued at the time of retirement and revised afterwards do reflect changes prescribed by the Govt. in the pay scales on the recommendations of different Pay Commissions, record the stage of pay in the Pay Scale/Pay Band of a person retired. But it is silent on the number of increments earned after promotion to the grade in which a particular pensioner had retired. May please recall that pay fixation on promotion, as per FR 22, is arrived at after granting one increment in the pre-promotion scale followed by stepping up the same to the immediate next stage of pay in the higher grade if there is no stage after grant of increment in the lower grade. Some of the promotees may get fixed at the minimum (First stage) of the higher grade whereas others may get fixed at the second or third next stage depending upon the pay in the lower grade. 5. The recommendation of 7thCPC vide their para10.1.67(option1) for Parity of Pension is based on legal & Constitutional grounds and as such to maintain sanctity it needs to be implemented in toto. 7. Fixation of notional pay of pre 2016 pensioners on the basis of the stage corresponding to the grade of pay in which a pensioner had retired would offer a fair & equitable option in all cases where records cannot be traced inspite of best efforts. 8 To meet the ends of justice, Bharat pensioners Samaj request that a personal hearing be granted to its delegation before any adverse decision is arrived at by the Committee. Secretary General, Bharat Pensioners Samaj. Just a few months before the new crop of payment banks start their operations, their chiefs are a worried lot. The banking regulator's ask in terms of meeting the Know Your Customer (KYC) norms has put them at par with traditional banks, and firms are concerned that the preference for "paper-based" KYC will be a cost-intensive and time-consuming exercise — and therefore a major impediment to the growth of the new age banks. Paytm payment bank's CEO Shinjini Kumar told ET that the industry is very "aggrieved" with the Reserve Bank of India (RBI) asking all entities to adhere to the centralised KYC system instead of just relying on the Aadhaar-based eKYC for payment banks. "We are grappling with that problem right now and we are talking to different people. We are hoping that there will be some understanding. Anyway our accounts are capped at Rs 1,00,000. There should be no reason why eKYC should not be the only way to do KYC. It is also digital and more authentic." Chiefs of Aditya Birla Idea Payments Bank, Sudhakar Ramasubramanian and Vodafone M-pesa payments bank Suresh Sethi also aired similar concerns to ET. They argue that payment banks do not have the same manpower to collect paper-based KYC like traditional banks and given that they are capped at a balance Rs 1,00,000, they do not share the same amount of risk. While RBI had earlier accepted eKYC as a means for customer authentication at the time of opening accounts, the new norms mandate a common KYC across all financial services entities for which detailed KYC is required to be collected and uploaded as a paper form to a central KYC repository — Central Registry of Securitisation Asset Reconstruction and Security Interest of India, or CERSAI. The idea is to streamline the KYC process and avoid duplication of KYC for customers at multiple agencies. But, for payment banks to be cast under the same net, it means that instead of just relying on the biometric based eKYC they will have to collect more details of their customers and upload them to the central registry. Sudhakar who is the CEO (designate), of Aditya Birla Idea Payments Bank said that in the case of payment banks a phased approach towards KYC will be better received since the whole idea behind the payment banks is towards financial inclusion. "If we have too many restrictions for someone who keeps Rs 5,000 in the account, it could prevent many of the unbanked from experiencing the benefits of financial services. 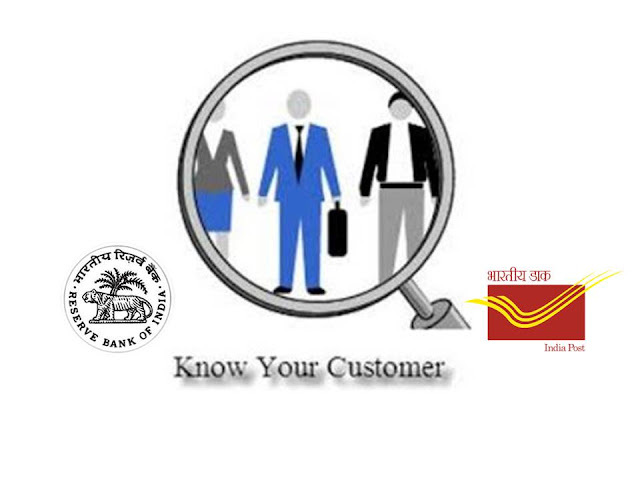 KYC norms can be applied in a layered manner as the customer's balance and transactions increase," he said. Digital KYC will help ease the "entry barrier" for such people along with being a more authentic means of KYC than a physical KYC. "Currently, over 90% of all retail transactions are through cash in the country, if these transactions have to be converted into the electronic format, banking will have to be relived from some of these troubles," he added. 7th Pay Commission: Would Committee of Secretaries use 2.86 to 3.16 fitment factor to revise minimum salary of Central Govt employees? New Delhi, Aug 29: The high-powered Committee of Secretaries, constituted by Centre to look into the anomalies regarding the implementation of 7th Pay Commission, has scheduled an important meeting with the National Joint Council of Action (NJCA) on September 1 to note down the grievances of the aggrieved central government employees. The NJCA would be represented in the meeting by its convenor Shiv Gopal Mishra, who is the leading voice among those articulating the cause of employees. Although a range of issues would be discussed in the meeting, the three most prominent issues which employees want NJCA to raise in an uncompromising manner are: hike in Fixed Medical Allowance (FMA), enabling‘Option 1′ for pensioners and revision in the hike of minimum salaries. The employee unions have demanded the government to use 3.68 fitment factor to hike the minimum salary, instead of current 2.57. However, there is a possibility that the Committee of Secretaries could find a middle route by using fitment factor between 2.86 to 3.16. The entry level salary as per the 6th Pay Commission is Rs 7,000. As per the recommendations of Justice (retd) AK Mathur led 7th pay panel, government used the 2.57 fitment factor to determine the minimum wage. This increased the existing salary to Rs 18,000. The decision came as a major shock to the employee unions and staff side JCM as in several meeting during the preparation of 7CPC report, it was indicated that a fitment factor ranging from 2.86 to 3.68 would be applied. Confederation of Central Government Employees collectively stated that considering the current inflation, government should use the 3.68 fitment factor which would increase the minimum salary to Rs 26,000. If one takes cue from the revisions made in 6th Pay Commission, government could likely to take the middle route again. The 6CPC had recommended a minimum salary of Rs 6,600, ignoring the demand of staff side JCM which vowed to go on a strike on anything less than Rs 10,000. Later, the salary was upgraded to Rs 7,000 which reconciled the dissidents. Similarly, the government could find a middle route and restructure the minimum pay as per 7th Pay Commission by using a fitment factor between 2.86 to 3.16. 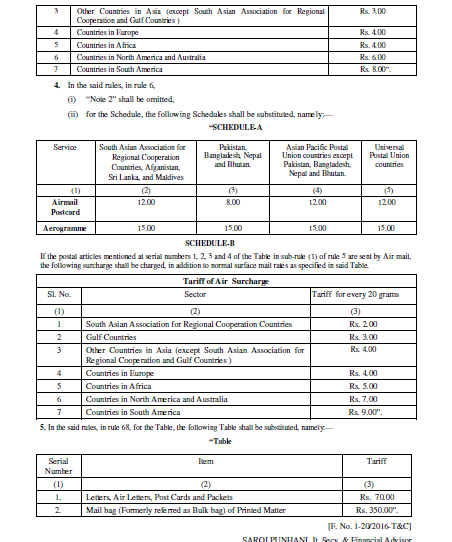 If the Committee of Secretaries use 2.86 fitment factor to hike the minimum salaries, the new entry level pay would be Rs 20,020. If the government uses 3.16 fitment factor, the minimum salary would be hiked to Rs 22,120. If a fitment factor of 3.00 is applied, the minimum salary would be restructured to Rs 21,000. Although some reports in the past week had suggested that the minimum salary of Rs 18,000 would remain unaltered, there is a strong possibility that the government could soften its stance after the September 1 meeting. Aggrieved central government employees have indicated that they would call for a mass strike if the NJCA convenor Shiv Gopal Mishra fails to effectively negotiate with the government. New Delhi, Aug 28: To discuss the anomalies related to the implementation of 7th Pay Commission, the high-powered Committee of Secretaries formed by Centre has invited leading employee union National Joint Council of Action (NJCA) for a meeting on September 1. NJCA would be represented at the meet by it’s current convenor Shiv Gopal Mishra. Aggrieved Central Government employees pin their final hope in the outcome of the Sept 1 meeting. If the Government constituted body fails to incorporate their demand, a large section of the organized workforce would call a strike. Although, it has not been revealed whether the Committee of Secretaries would attempt to negotiate the demands at the upcoming meet, it has been assured that grievances of the employees, as raised by the Unions, would be noted down in a detailed manner by the Secretaries. Representing NJCA, Shiv Gopal Mishra is expected to show an uncompromising stand on at least the following three demands: 1) Hike in Fixed Medical Allowance (FMA), 2) Revision in the hike of minimum salary, 3) Availability of ‘Option 1′ for pensioners. It seems that nobody is satisfied with their 7th Pay Commission pay hike. At every level there appears to be an upward pressure on salaries and allowances, everyone deserve more pay than 7th Pay Commission pay hike. The 7th Pay Commission pay hike has got recent media attention, while, at the other end, there has been debate about the hiking of pay on the recommendations 7th Pay Commission is proper or not. According to the commission’s recommendations, the minimum pay has been fixed at Rs.18,000 and the maximum at Rs.2.5 lakh for the cabinet secretary, the country’s senior-most civil servant. The commission had recommended a 14.28% increase in basic pay and the cabinet went with ditto to it. The previous 6th Pay Commission had recommended a 20 per cent hike which the government doubled while implementing it in 2008. There has been widespread demand from central government employee unions to hike the minimum pay to Rs.26,000; but the government has not accepted the demand till date. After the central government employees union had threatened to carry out an indefinite strike, the government had promised hiking minimum pay but they are not now in mood for hiking the minimum pay. Inequalities in pay can be damaging. Excessive remuneration of top bureaucrats has been made to unnecessarily drive up average pay in middle-lower ranks, and dramatic differences between levels throughout government business can undermine motivation. In a wider social sense, perceived inequalities between groups leads to huge discontent and instability. Aaccording to the notification of cabinet approved 18 pay matrices, the rate of increase of cabinet Secretary’s basic pay is 178 per cent as he got Rs 90,000 (fixed) in the immediate past under 6th pay commission recommendations, while middle-lower ranks employees will now only get 157% increase of their basic pay merging dearness allowances. The pay ratio between the Indian top most bureaucrat and the lowest grade employees in the 7th Pay Commission recommendations is 1:13.9, which was 1:12 in the 6th Pay Commission recommendations. All pay commissions except 7th Pay Commission made up pay gap between lower paid employees and top bureaucrats from second Pay Commission 1:41 ratio to Sixth pay commission 1:12. Subsequent pay commissions reduced the ratio of pay between lowest earning employees and top bureaucrats from 1:41 in 1947 to about 1:12 in 2006, while 7th Pay Commission made it higher about to 1:14. The cabinet has approved the hike of the basic pay but decided to defer the recommended 63% allowances hike in the government employees pay package and refer the matter to a committee headed by Finance Secretary Ashok Lavasa. Allowances contribute a lot in the pay hike recommendation. If the allowance is not taken into consideration it will mean fewer amounts because the allowance which the commission proposed is very substantial. 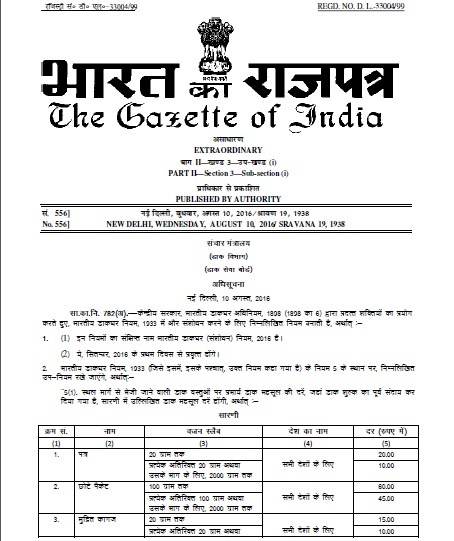 The hike in allowances, which will give them more money in the pocket, the compensatory perks for all central government employees, which is likely to be paid from October 1 and no arrears for allowances (except Dearness Allowance) is paid, as per usual practice, the allowances is paid from the date of implementation. This also a cause of unhappiness in central government employees. JODHPUR: The postal department has introduced the electronic monitoring technology for letter box clearance through the 'Nanyatha' software developed by the postal department. 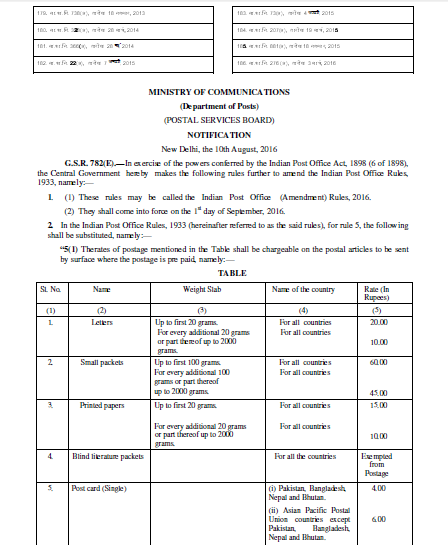 The programme helps to know the status of letters dropped in the box and functioning of the delivery system in the postal network through internet. 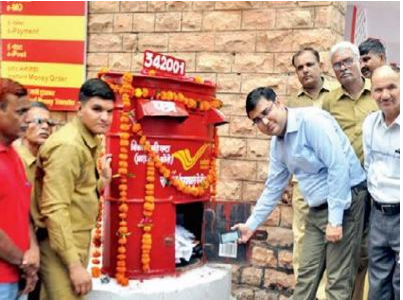 Krishna Kumar Yadav, director of postal services, Rajasthan Western Region, Jodhpur, launched the software in Jodhpur on Saturday which is aimed at monitoring the clearance of letter boxes installed at various locations. "This application helps in uploading information about the location of letter box, date and time of clearance and total number of letters, when the barcode is scanned using a smartphone," said Yadav. 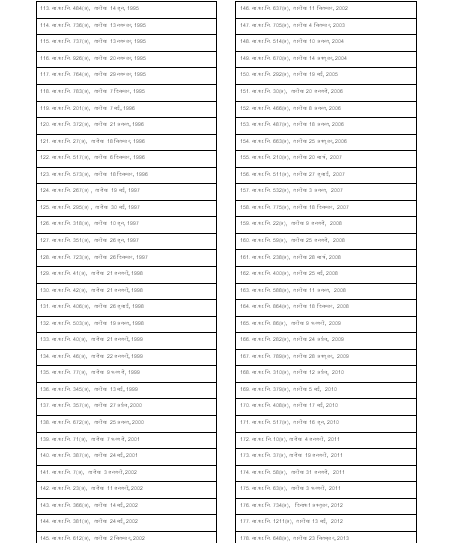 "Each letter box is assigned a unique barcode consisting of a pincode followed by a 12-digit serial number. After getting the location, letter box attendant opens it, counts the number of letters inside, and scans the barcode through mobile by using the installed Android app. Then the attendant writes his/her name and the number of articles cleared through the app on the smartphone, which gets uploaded on the server," said Yadav. This software also facilitates the public to know the status of letter which is posted in a particular letter box. Customers, by just a click of mouse, can know whether their letters have been collected from the letter box or not. It is also possible to know the date, time and name of the postman who cleared the letters. Yadav said that the application will be first introduced in Jodhpur city and will be spread to entire region gradually. In first phase, 22 letter boxes under the control of Jodhpur head post office will be covered in this scheme. Krishna Kumar Yadav, Director Postal Services, Rajasthan Western Region, Jodhpur launched this software here on Saturday aimed at monitoring the clearance of letter boxes planted at various locations attached to post offices. "This application helps in uploading the data about the location of letter box, date and time of clearance and number of letters, when the bar code is scanned using a smart phone", said Yadav. "Each letter box is assigned a unique barcode consisting of a pin code followed by a twelve-digit serial number. After capturing the location, letter box attendant opens it, counts the number of letters inside, and scans the barcode fixed inside through the hand set by using the installed android application. Then the attendant enters his/her name and the number of articles cleared through the app on the smartphone, which gets uploaded on the server", said Yadav. This software also facilitates the public to know the status of letter clearance which is posted in a particular letter box. Customers by a click of mouse can know whether the letters dropped by them in letter boxes are collected or not. It is also possible to know the date, time and name of the postman who picked up the letters. Yadav said that the application will be first introduced in Jodhpur city and later will be spread to entire region gradually. In first phase, 22 letter boxes under the control of Jodhpur Head Post Office will be covered in this scheme. Hyderabad: A total of 51 Post Offices (POs) in Telangana State and Andhra Pradesh have been identified for functioning as payments bank branches, providing a slew of services, including distribution of financial products. These offices - 34 in Andhra Pradesh and 17 in Telangana - will operate as branches of India Post Payments Bank (IPPB). IPPB came into existence after it received certificate of incorporation from the Registrar of Companies, setting the stage for the new bank to start operations in 2017. 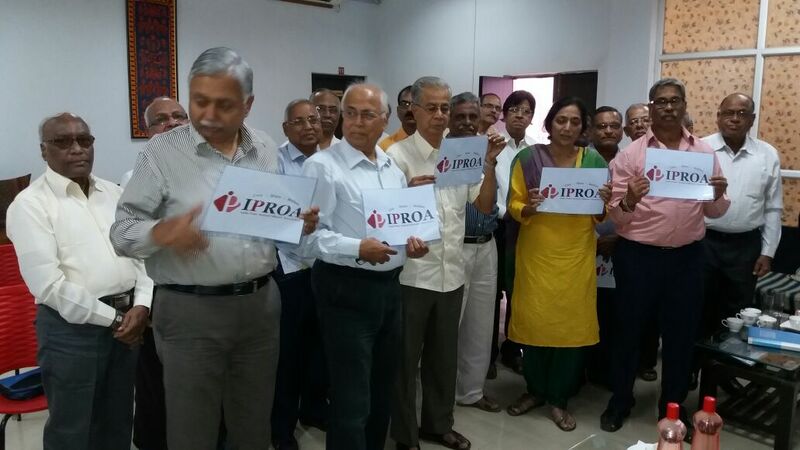 Similarly, 17 POs have been identified for IPPB branches in Telangana. Of these, Hyderabad GPO will be operational as IPPB branch by March 2017 and remaining 16 by September 2017, Rai said. 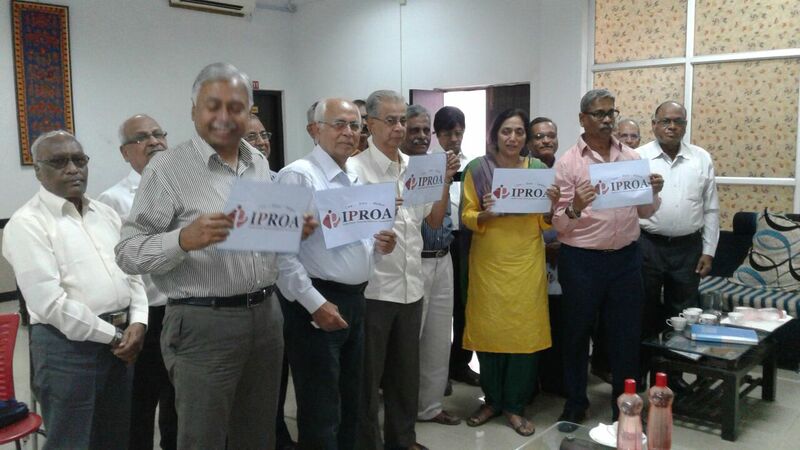 The benefits of IPPB include doorstep banking through postmen and Grameen Dak Sewaks, distribution of third party financial products like loans, insurance, pension products, mutual funds, international and domestic remittances, payment of utility bills, municipal dues, fees, government payments, taxes, DBT and MNREGA disbursements, among others. "IPPB will drive the benefits of financial inclusion by bringing a host of financial products to suit the needs of different strata of society with special focus on the marginalised sections rural areas," Rai added. Recent pay commission has just given a small hike in pay where as many anomalies are likely to arise . Promotional loss are seen for officials promoted from 2800/- grade pay to 4200/- grade up to 01.07.2017.. Officials can opt for next increment for fixation if promotion falls before 01.07.2017. Heavy loss for option to take fixation from 01.07.2017 and officials have to forgo all the arrears of Pay Commission until their next increment. This has caused greater dissatisfaction among the employees. Promotion to next level provide only one increment and does not provide any additional benefit. Even if the officials decline promotion they would get the same in their next date of increment. Hence Promotion in 7th CPC is total waste. "If Google-Drive download link is not opened in Sify network, please send email to email ID --- dhamotharan@outlook.com so as to receive the file through email. Subject : Simultaneous action of prosecution and initiation of departmental proceedings. 2. It is noticed that in many cases charge sheets are not issued despite clear prima facie evidence of misconduct on the ground that the matter is under investigation by an investigating agency like Central Bureau of Investigation. In the aforesaid judgement the Hon’ble Court has also superseded the direction of the Central Vigilance Commission that pending a criminal investigation, departmental proceedings are to be held in abeyance. It must be remembered that interests of administration demand that the undesirable elements are thrown out and any charge of misdemeanor is enquired into promptly. “The disciplinary proceedings are meant not really to punish the guilty but to keep the administrative machinery unsullied by getting rid of bad elements. The interest of the delinquent officer also lies in a prompt conclusion of the disciplinary proceedings. If he is not guilty of the charges, his honour should be vindicated at the earliest possible moment and if he is guilty, he should be dealt with promptly according to law. It is not also in the interest of administration that persons accused of serious misdemeanor should be continued in office indefinitely, i.e., for long periods awaiting the result of criminal proceedings. 5. In Capt. M. Paul Anthony vs. Bharat Gold Mines Ltd. & Anr; , (1999) 3 SCC 679, the Supreme Court has observed that departmental proceedings and proceedings in a criminal case can proceed simultaneously as there is no bar in their being conducted simultaneously, though separately. If the trial of the criminal charge results in conviction, disciplinary proceedings are bound to follow against the public servant so convicted. Even in case Of acquittal proceedings may follow where the acquittal is other than honourable. Acquittal by a criminal court would not debar an employer from exercising power in accordance with Rules and Regulations in force. The two proceedings criminal and departmental are entirely different. They operate in different fields and have different objectives. Whereas the object of criminal trial is to inflict appropriate punishment on offender, the purpose of enquiry proceedings is to deal with the delinquent departmentally and to impose penalty in accordance with service Rules. In a criminal trial, incriminating statement made by the accused in certain circumstances or before certain officers is totally inadmissible in evidence. Such strict rules of evidence and procedure would not apply to departmental proceedings. The degree of proof which is necessary to order a conviction is different from the degree of proof necessary to record the commission of delinquency. The rule relating to appreciation of evidence in the two proceedings is also not similar. In criminal law, burden of proof is on the prosecution and unless the prosecution is able to prove the guilt of the accused beyond reasonable doubt', he cannot be convicted by a court of law. In departmental enquiry, on the other hand, penalty can be imposed on the delinquent officer on a finding recorded on the basis of 'preponderance of probability'. Acquittal of the appellant by a Judicial Magistrate, therefore, does not ipso facto absolve him from the liability under the disciplinary jurisdiction of the Corporation. 8. The judgement of the Hon’ble Supreme Court in GM. Tank vs State of Gujarat (2006) 5 SCC 446 has reaffirmed the principles laid down in RP. Kapur (supra). In G.M. Tank case, Court observed that there was not an iota of evidence against the appellant to hold that he was . guilty. As the criminal case and the departmental proceedings were based on identical set of facts and evidence, the Court set aside the penalty imposed in the departmental inquiry also. 9. Ratio in the GM. Tank judgement should not be misconstrued to mean that no departmental proceedings are permissible in all cases of acquittal or that in such cases the penalty already imposed would have to be set aside. What the Hon’ble Court has held that is no departmental inquiry would be permissible when the evidence clearly establishes that no charge against the Government servant may be made out. When a public servant was found guilty of corruption after a judicial adjudicatory process conducted by a court of law, judiciousness demands that he should be treated as corrupt until he is exonerated by a superior court. The mere fact that an appellate or revisional forum has decided to entertain his challenge and to go into the issues and findings ‘made against Such public servants once again should not even temporarily absolve him from such findings. If such a public servant becomes entitled to hold public office and to continue to do official acts until he is judicially absolved from such findings by reason of suspension of the order of conviction it is public interest which suffers and sometimes even irreparably. 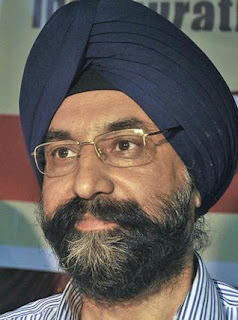 When a public servant who is convicted of corruption is allowed to continue to hold public office it impair the morale of the other persons manning such office, and consequently that would erode the already shrunk confidence of the people in such public institutions besides demoralising the other honest public servants who would either be the colleagues or subordinates of the convicted person. If honest public servants are compelled to take orders from proclaimed corrupt officers on account of the suspension of the Conviction the fall out would be one of shaking the system itself. 11. Thus action against a convicted Government servant should be taken straight away under Rule 19(1). An appeal against the conviction or even a stay on the sentence will have no effect unless the conviction itself is stayed. (i) All incriminating documents should be seized promptly to avoid their tempering or destruction of evidence. (ii) Particular care needs to be taken for retention of copies of such documents while handing over the same to an investigating agency. These documents may be attested after comparison with the originals. (iii) In case the documents have been filed in a court, certified copies of documents may be obtained. (iv) Documents and other evidence must be examined to see whether any misconduct, including favour, harassment, negligence or violation of rules/ instructions has been committed. If there is a prima facie evidence of misconduct, charge sheet under the appropriate rule must be issued. (c) an acquittal on technical grounds or where a benefit of doubt has been given to the accused will have no effect on a penalty imposed under CCS (CCA) Rules, 1965, as while in a criminal trial the charge has to be proved beyond reasonable doubt, in the departmental inquiry the standard of evidence is preponderance of probability. (vi) An appeal by the accused against conviction, but where the conviction has not been overturned /stayed, will have no effect on action taken under Rule 19(i) of the Co8 (CCA) Rules, 1965, even if Court has directed stay/ suspension of the sentence. 13. All Ministries / Departments are requested to bring the above guidelines to the notice of all concerned officials for compliance.